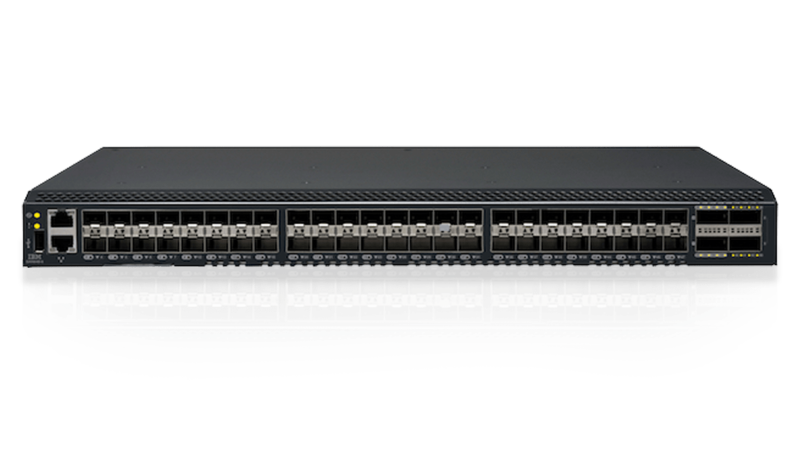 The IBM® Storage Networking SAN64B-6 switch is designed to meet the demands of hyper-scale virtualization, larger cloud infrastructures and growing flash-based storage environments by delivering market-leading Gen 6 Fibre Channel technology and capabilities. SAN64B-6 provides a high-density storage networking building block for increased scalability designed to support growth, demanding workloads and data center consolidation in small to large-scale enterprise infrastructures. Shatter application performance barriers with up to 100 million input/output operations per second (IOPS) and increased performance for demanding workloads across 32 Gbps links. Leverage high scalability in an ultra-dense, 1U, 64-port switch and deliver greater hardware consolidation with fewer switches. Utilize 128 Gbps port speeds for greater hardware consolidation with fewer optics and cables required to connect switches. Detect degraded application performance with built-in device latency and IOPS metrics. Increase resiliency by automatically discovering and recovering from device or network errors. Simplify troubleshooting with real-time and historical visibility in a single dashboard. Validate and benchmark the physical infrastructure to ensure predictable performance prior to deployment.